Last year I blogged a post about the top 3 mistakes teachers of novices make. It made a big splash, in the cyber world anyway. Something about that post resonated with teachers. 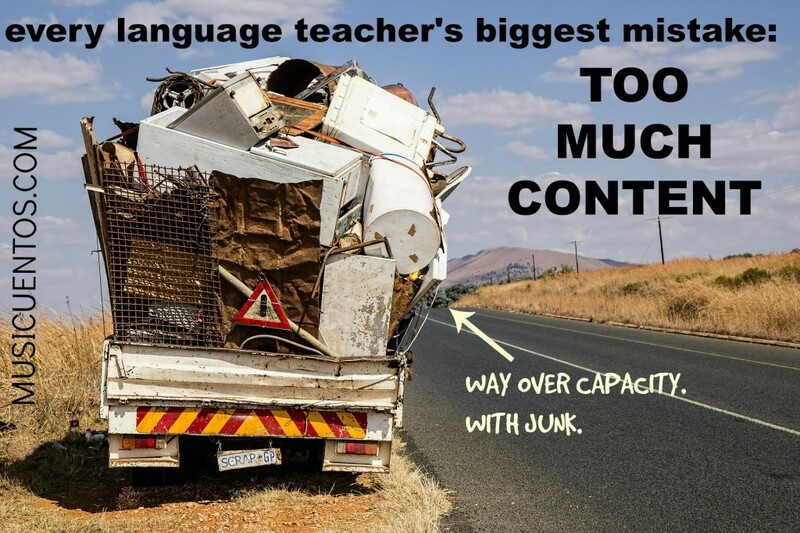 But it didn’t address the biggest mistake all of us make – the cancer that plagues world language teaching and makes programs far and wide almost completely ineffective in the long term. What is it we’re doing wrong? When I first started teaching, I came into a program that had a set textbook. It was a college textbook called Puntos de partida and the program used half of it for Spanish 1 and half for Spanish 2 (there was no Spanish 3 until I got there). So can you guess what I did? Well, I did what any other grammarian fresh out of college would do. I taught it. All of it. Every last page and every exercise. Yes, my Spanish 1 students “learned” present tense and preterite tense and ended the year by dabbling with imperfect tense. My Spanish 2 students learned the rest. All the rest. Future, conditional, subjunctive. All the compounds. In two years of Spanish my students studied and were assessed on 14 verb tenses. And the personal a. Passive voice. Every form of pronoun. Superlatives. Can you imagine how proud I was? I was world’s greatest Spanish teacher. I couldn’t believe how students would transfer into Spanish 2 and hadn’t seen the past tenses yet. What kind of teacher did they have anyway? I say this so you know I was there. Often, I still am there, but ten years ago, I was the queen of do-it-all-or-die-trying. And do you know how many students I taught could actually do anything in Spanish after they left my class? A handful. Five years later? Probably three, and that’s because one of them moved to Spain to cycle professionally. Why? Because I was so focused on teaching all of it that I forgot to care if they were learning any of it. If you’re a new teacher and you’re beaming with pride over how much more content you’re covering than other teachers you know, hear me tell you don’t be. If you’re a lone communicative teacher surrounded by colleagues and administration telling you to just finish the book, hear me tell you don’t despair. Don’t drink the Kool-aid. If you’ve been teaching for decades and you’re an advanced speaker of the language you teach and you’ve forgotten just how insanely much time it takes to develop that proficiency, hear me tell you please remember. On the practical side, here’s some advice to keep in mind to help prevent you from committing this widespread, crippling mistake. Pause for a brain-based reality check. If you could talk to the students I taught ten years ago, they’d tell you what the vast majority of people who have ever sat in a U.S. world language class (and many researchers) would echo: unless there is some memory-enhancing event like intense emotion, that which is learned fast is rarely learned well. Eat, sleep, live proficiency standards. It will help you get a handle on what your students are really capable of in the time you have them when you become very familiar with a quality proficiency standards document, like the one published by ACTFL. Keep in mind what realistic goals are (check out what veteran Carrie Toth learned about that). A somewhat realistic goal for the average high school student in a very communicative language program is to achieve novice high in the first year and intermediate low in the second year. * Guess when a speaker can accurately manipulate multiple time frames? Not until they achieve advanced proficiency, which is very difficult to do in high school for the average person. When you have proficiency-oriented goals, it doesn’t make sense to disconnect your assessments from them. If you want students to show they can make plans with a friend to go somewhere, make that your assessment. Want to see some sample assessments? You can find many of my Spanish 3 proficiency assessments here. Stop believing in the Bell curve. The idea that some students in language class should be excelling while others should be failing and the majority should be 20-30 percentage points below the top performers is completely unrealistic in a language class. Whether or not it’s true in other classes, it’s not true for us. People learn language differently from any other subject. And unless your students have some kind of brain defect, they are capable of learning language regardless of how they do in other classes. Especially when I was teaching lower elementary, before students were brainwashed by what school was “supposed” to be like, I was baffled by teachers who would ask me how this or that student was in my class. They’re all great, I said. I couldn’t tell you who was good at math or history or music. I knew they could all do it, and so did they. When you believe that 100% of your students are capable of acquiring language (some won’t because they simply refuse to be engaged by anything, but they can), this confidence will affect how much content you attempt in your class. Keep your eyes on the long-term. Finally, and most importantly, we’ve got to stop teaching like the grade on the test makes any difference. If you teach asking yourself, “Will my students be able to use this a year from now?” instead of “Will my students be able to match these vocabulary words on my test next week?” you’ll stop teaching so much content and buy into the sweetest spot in language teaching: teaching less content, better. Ignore those naysayers. Educate your administration. Believe in all your students. Choose to teach better by teaching less and you’ll all be better off in the long run. *Even achieving IL after 2 years is not typical, but the proficiency-focused cohort of teachers from the Jefferson County (KY) Public Schools showed it could be done with a significant percentage of students. I bet you’re familiar with a couple of them- Kara and Megan of the Creative Language Class blog. I have definitely been in the position of “cover the entire textbook at whatever cost.” It was exhausting and not fulfilling for either students or for me. I like how you reframe goals from “master xyz grammar points” to “make plans for upcoming activities.” But how does a language teacher explain all this to administrators who themselves are under pressure to meet state or other criteria for student learning? It seems like a systemic issue that has to be addressed at many higher levels. And in the meantime, language teacher goals of having students truly learn and enjoy the language can get lost in the shuffle. Click the links in the first bullet point and start by directing them to research by people a lot smarter than they are. 🙂 Good luck! I’m getting ready to be thrown into a “cover the book at all costs” environment as part of a FR101/102 cycle at my university. Everyone has to cover half the book in a semester; everyone has the same final. I’m really doing some soul searching this year before I start my TAing and trying to figure out how to marry these two things… Any thoughts/wise counsel would be appreciated! This is my biggest failing. I am lucky to have very vocal students who let me know when they’re overwhelmed. It is very hard to step off the “finish the book merry go round”. Thank you for this timely reminder. Thank you for reminding me about what’s more important as a World Languages’ teacher. Thank you for this great advice! I threw out my textbook three years ago, but sometimes I still wonder if I’m “covering” enough with each grade (I teach Spanish 1 and 2). Great question! The ACTFL document page actually has samples for you. For example, for novice speaking look here and you’ll see a link to “View Samples.” At the top of that page you can navigate among speaking levels and on the left you can navigate among the modes. Good luck on your journey! Yes! I am always at least a chapter behind my colleagues because I really want my students to LEARN the material, not just cram it for a quiz/test and then move on. Every time we talk about curriculum, I bring up the fact that I think we are teaching too much content, but everyone else in the department thinks it’s an appropriate amount (because we need to cover half the book in year 1, half the book in year 2, then blow them through the entire next book for year 3!). It’s hard to regulate content when you’re dealing with 4 other people.